What do people find in this series? 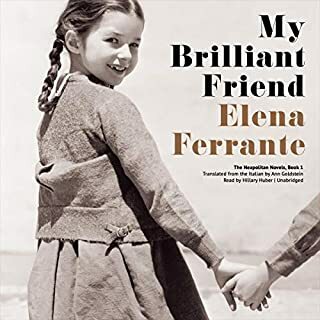 Has My Brilliant Friend turned you off from other books in this genre? Yes and no. I read in their entirety the first three books, largely on the strength of a strong recommendation from a thoughtful friend whose tastes I usually share. I persisted only because of her--if she thought so highly of this series, I must be missing something.I reached the end of Those Who Leave and Those Who Stay Behind this morning, and that's it for me. 1. The reader lacks nuance entirely. She should have varied her intonation according to context. In every case of disputatious conversation--to give just one example-- her voice dripped with sarcasm. It was the same throughout the three volumes, yet not every such conversation entailed sarcasm! 2.This gave me the strong impression that she had not read the books before performing them: she was just not engaged. She should read and engage with her material before recording it, otherwise the performance is flat and unconvincing. 3. If the reader is performing a book set in Italy, should have learned how to pronounce the few Italian (and, later German) words that came up. What character would you cut from My Brilliant Friend? I'm at a loss to say, because the first book sets us up to anticipate that by the end of the saga, we will have learned something interesting and perhaps profound about Lila and Lena. Along the way, a good writer would give us clues about what she has in mind in that regard. But the characters of the two protagonists (ARE they protagonists? I thought so in the first book, but it became less clear thereafter)--and the characters of the others, no less--are undeveloped. Motivations, time after time, are implausible or unintelligible or illogical. One has no sense where this writer is leading us. I wondered frequently whether I would have liked the book better if the reader had been better. I don't think so: in addition to my dissatisfactions noted above, I have to add that the translation is uninspired. Every character uses the same set of words and expressions. "Chiaro?" in Italian is ploddingly translated, time and again, as "Is that clear?" This is not always exactly idiomatic in context.Very disappointing: author, translator, reader.